Gooding’s top Pebble Beach 2016 classic car auction results were four cars sold over $10 million including the most-expensive Bugatti ever. The top results were $18,150 for a 1959 Ferrari 250 GT LWB California Spider Competizione followed by $13,500,000 for a 1960 Ferrari 250 GT SWB Berlinetta Competizione. A 1933 Alfa Romero 8C 2300 Monza sold for $11,990,000 while $10,400,000 for a 1932 Bugatti Type 55 set a new marque record and is also the most-expensive French car ever. Gooding achieved million dollar plus results for 26 cars at Pebble Beach 2016. Gooding & Company held its annual Pebble Beach classic car auction on August 20 and 21, 2016, on the Monterey Peninsula in California, USA. Gooding set a new company record earning $129,8 million in sales during the two day event. The 115 of the 138 lots offered sold for a sell-through rate of 83% and an average of $1,128,606 per car. Gooding sold 26 cars for more than a million dollars with four selling for more than $10 million. 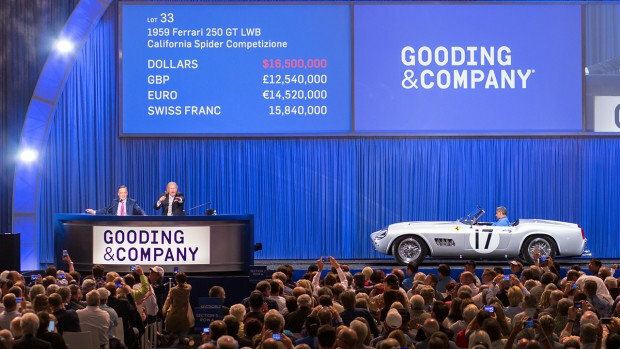 A 1959 Ferrari 250 GT LWB California Spider Competizione sold for $18,150,000 at the 2016 Pebble Beach auction – the highest result ever achieved by Gooding & Company. This is also the highest price ever paid for a long wheelbase California Spider but the record for a short wheelbase model remains $18,650,000 paid for the barn-find Baillon 1961 Ferrari 250 GT SWB California Spider at Artcurial’s Paris 2015 sale. The 1959 Ferrari 250 GT LWB California Spider Competizione is one of only nine alloy-bodied LWB California Spiders. It was raced in period with its most noteworthy result 5th overall at the 1960 12-Hours of Sebring race. Gooding’s second highest result at Pebble Beach 2016 was for another competition specification Ferrari. A 1960 Ferrari 250 GT SWB Berlinetta Competizione sold for $13,500,000. This Ferrari was raced by NART at the 1060 Le Mans 24 Hours and finished 7th overall driven by Ed Hugus and Augie Pabst. The car retained its original Scaglietti coachwork and engine. Gooding sold a 1933 Alfa Romeo 8C 2300 Monza for $11,990,000 – the second most-expensive Alfa Romeo and the second most-expensive pre-Second World War car ever. (The record for both was set just a day before at RM Sotheby’s when a 1939 Alfar Romero 8C 2900B Lungo Spider sold for $19.8 million.) The Alfa Romero retained its original Brianza body despite being raced extensively during the 1930s and 1940s including to victory in the 1947 Italian Sports Car Championship when raced by the Scuderia Balestrero. The 1932 Bugatti Type 55 Roadster competed in the 1932 Mille Miglia race, driven by Achille Varzi, although a punctured fuel tank ended its race early. It may have been the company car of Jean Bugatti but parts of its early history are uncertain. Bugatti produced 38 Type 55 cars of which only 14 wore roadster coachwork. 1950 Ferrari 166 MM Berlinetta – sold for $5,445,000. 1979 Porsche 935 – Paul Newman’s Le Mans car sold for $4,840,000. 1955 Lancia Aurelia B24S Spider America sold for a model record $2,007,5000. 1955 Mercedes Benz 300 SL Gullwing for $1,430,000 and a 1960 Mercedes Benz 300 SL Roadster for $ 1,237,500 – prices seem lower than a few years ago and only four of the six offered during the week in Monterey sold. 1914 Marmon 41 Speedster sold for $1,017,500. RM Sotheby’s and Bonhams also had strong results with pre-First World War cars at Monterey 2016. The most-expensive two cars not sold at the Gooding Pebble Beach 2016 auctions were a 1962 Ferrari 250 GT SWB Berlinetta (est. $10 – 12 million) and a 1958 Porsche 550A Spyder that had a highest bid of $4.2 million rejected.